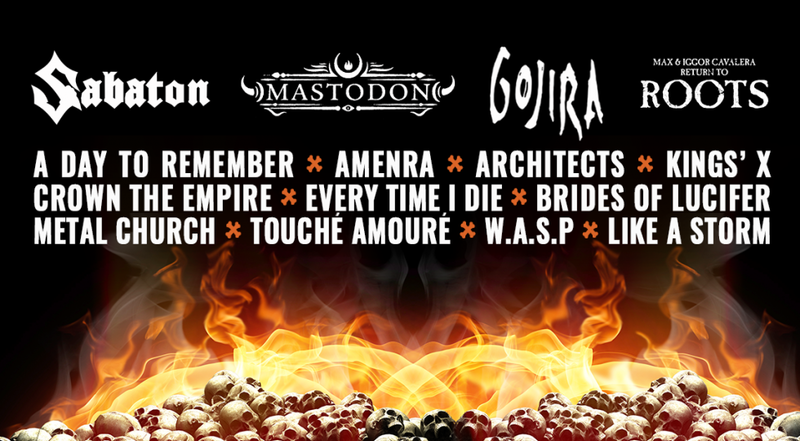 Belgium’s biggest and best mecca of metal is only 100 days away! Time to complete the line-up and to report on ticket sales and accommodation during the festival. 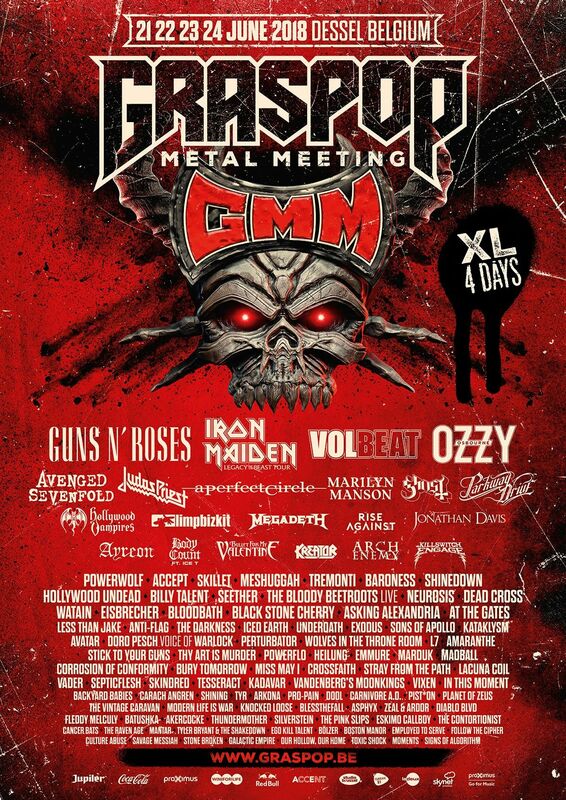 Graspop Metal Meeting, a 4-day event this year only, will take place in Dessel from Thursday, 21 June until Sunday, 24 June 2018. With fantastic headliners: Guns N’ Roses, Iron Maiden, Volbeat and Ozzy Osbourne and sub-headliners that are just as exhilarating: Avenged Sevenfold, Judas Priest, A Perfect Circle, Marilyn Manson, Ghost, and Parkway Drive. Another 16 names were added to the GMM18 line-up today. The line-up for GMM18 is now complete. SEE Above!!! A new year and a new list of names for Graspop Metal Meeting 2018. The 23rd edition is going to be a vintage year. The addition of these 26 bands more or less completes the bill. A new year, new names for the five stages at Graspop Metal Meeting 2017. Joining the bill for the 22nd edition are: A Day to Remember, Amenra, Architects, Brides of Lucifer, Crown The Empire, Every Time I Die, Gojira, King’s X, Like A Storm, Mastodon, MAX & IGGOR CAVALERA – RETURN TO THE ROOTS, Metal Church, Sabaton, Touché Amoré en W.A.S.P. Rammstein, Deep Purple and Evanescence have already been announced as the headliners. In 2017, Graspop Metal Meeting premiers a new diabolical super group: Brides Of Lucifer, a remarkable collaboration between the Kolacny brothers (Scala), Koen Buyse (Zornik) and Ives Mergaerts. A metal band fronted by 20 women – an almighty clash between driving guitars and blood curdling vocals. Or, in other words: Scala goes metal! Graspop Metal Meeting is also proud to add Brazilian metal legends Max and Iggor Cavalera to the line-up with their RETURN TO ROOTS tour. The brothers are celebrating the 20th anniversary of the legendary Sepultura album ‘Roots’, to be played in its entirety on Saturday June 17 in the Marquee! On Sunday 18 June – closing the festival with violently explosive guitars, flashing shades, thundering drums, addictive melodies and a two-ton tank – is: Sabaton! Out-and-out audience favourites at the Graspop Metal Meeting. It’s their sixth appearance on stage in Dessel. If you’re a fan, get dressed for the occasion, because it’s your last chance to see Sweden’s warriors Sabaton before their long and well-earned sabbat(on)ical from concert stages in Europe. The bill is filling nicely for Graspop Metal Meeting 2017. It’s about rock; it’s about roar. A weekend of blistering guitars, big bad drums and deep grunting. 82 great names have already been confirmed. More to come soon. With 16 new acts, the line-up for Graspop Metal Meeting 2017 is now complete! 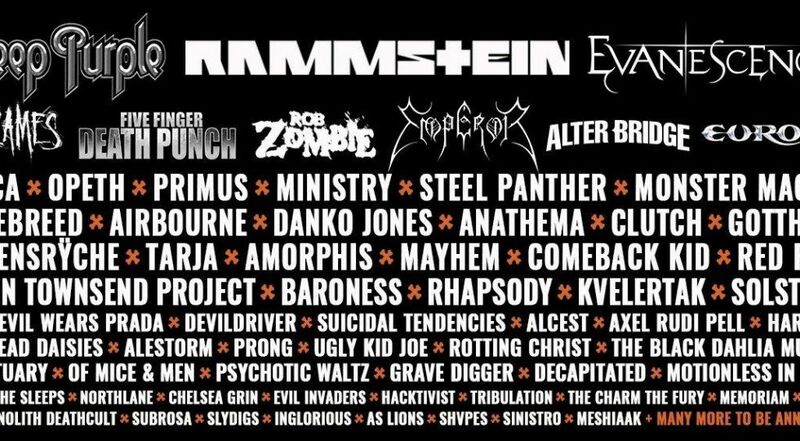 64 new names for Graspop! Here is that bumper crop of bands you’ve been waiting for: Airbourne, Alcest, Alestorm, Alter Bridge, Amorphis, Anathema, As Lions, Avatar, Axel Rudi Pell, Baroness, Chelsea Grin, Clutch, Comeback Kid, Danko Jones, Decapitated, DevilDriver, Devin Townsend Project, Emperor, Epica, Europe, Evil Invaders, Five Finger Death Punch, Gotthard, Grave Digger, Hacktivist, Hardline, Hatebreed, In Flames, Inglorious, Kvelertak, Mayhem, Memoriam, Meshiaak, Ministry, Monster Magnet, Motionless in White, Northlane, Of Mice & Men, Opeth, Primus, Prong, Psychotic Waltz, Queensrÿche, Red Fang, Rhapsody, Rob Zombie, Rotting Christ, Sanctuary, Shvpes, Sinistro, Slydigs, Solstafir, Steel Panther, SubRosa, Suicidal Tendencies, Tarja, The Black Dahlia Murder, The Charm The Fury, The Dead Daisies, The Devil Wears Prada, The Monolith Deathcult, Tribulation, Ugly Kid Joe, While She Sleeps. Earlier Rammstein, Deep Purple and Evanescence were announced as this year’s headliners. Head over here for more details on the new bands and the day schedules. The line-up for Graspop Metal Meeting 2016 is officially complete! Here is the final batch of 24 names for this year’s metal onslaught: The Winery Dogs, We Came as Romans, Rival Sons, Soilwork, Carach Angren, Enthroned, Municipal Waste, Secrets of the Moon, Bloodbound, Crobot, Beartooth, Kadavar, Collibus, The Shrine, Palisades, Bliksem, Primal Fear, Spoil Engine, Killer, Your Highness, Knives To A Gunfight, Bark, Fleddy Melculy and Reject The Sickness. Unfortunately Windhand and Devil You Know were forced to cancel but it’s looking like a vintage metal bash again in Dessel this year! Down have cancelled their European tour, including their appearance at Graspop Metal Meeting. Borknagar will also not be joining us this summer.